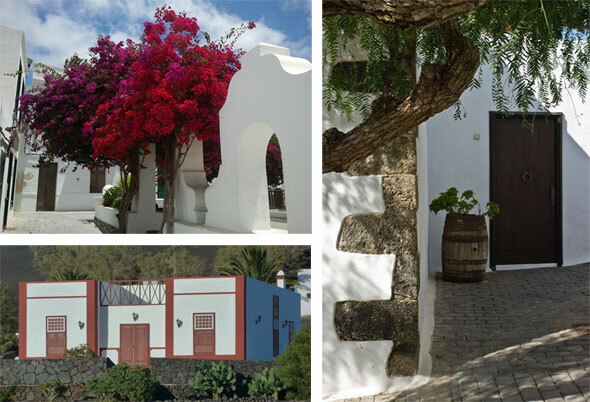 Lanzarote has an architecture full of charm, of simple beauty, with a strong constructive logic that arises with the order to give shelter and facilitate the life of the peasant, mainly influenced by two climatic factors: the trade winds and the shortage of water. The Alisio is a wind from the northwest, it is overloaded with humidity and of a strong intensity. This influences the orientation of the housing, being this south-southeast, and obliges the lack of openings in the north facade. There is another explanation for the lack of openings and is the high insolation, which prevents the entry of heat. The scarcity of water is the other major factor in the design of the houses. To do this the location and tilt of the housing plays an important role, like the roofs, pipelines and storage sites such as the underground reservoirs called “aljibes”. 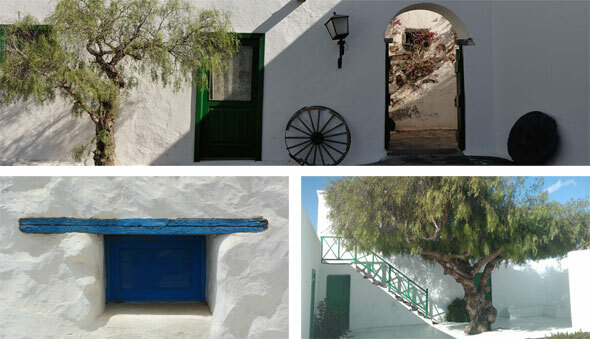 The functionality, the shortage of materials and economic differences between social groups are the essential features that help us to understand the island architecture. The three primary materials in the traditional architecture are: stone, wood and lime stone. The stone is the basic element of any building in the island, in particular by the lack of other materials, for what was considered material of first necessity. Due to the absence of forest masses on the island it is necessary to ensure the import of wood. Due to the high cost of it only the power groups in Lanzarote made a major use of it while the humble classes used wood of low quality, many times of wrecks arrived to the coast. In the homes of wealthy families had a greater presence of windows and doors beautifully decorated. These houses were also provided with wooden floors and ceilings. The lime stone is another of the important elements. This introduces refractantes properties, which converts it into a thermal insulator. They are also aware of their hygienic properties, which is why they white washed the roofs of the houses and the cisterns for the disinfection of the water. One of the most characteristic external elements of the houses are the chimneys, being able to find a great variety of models according to the richness of its inhabitants. While in the bourgeois houses are of a considerable size and have multiple influences: Portuguese, Byzantine and Arab, in the popular houses a few simple tubes with holes in the top perform the function. The bourgeois houses serve the same functions, although its structure is organized differently. 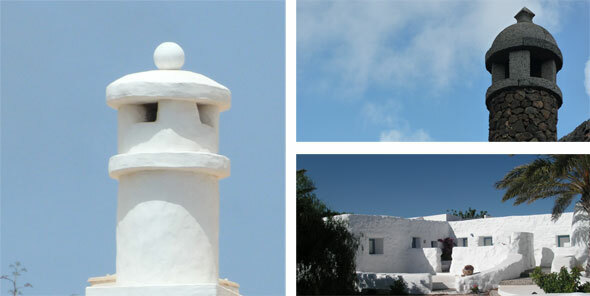 In summary, a simple architecture, pragmatic and of an special beauty that gives to Lanzarote a unique personality.